I begin this week by recounting an experience. A year ago, a writing group invited me to present a workshop at a locale about 100 miles from home. When I arrived, I learned to my dismay, the audience consisted of fourteen published authors; people who made some or all of their living by writing. I launched into my spiel with a high degree of apprehension. To my relief, the outcome was an excellent exchange of ideas. My listeners had a great deal more writing experience than I did, but their knowledge, instead of being a deterrent to their interest, was an asset. At the end of my presentation, one of the authors thanked me, saying, "You sure made me think. Some of your ideas are pretty good." I do not tell you this to boast about my competence as a lecturer, but rather to reveal the lesson I learned. Outside the normal rules of grammar and punctuation, no right and wrong exists in the writing business, but new ideas or alternate approaches to creative writing problems stimulate writers. My audience that day knew most everything I said, but the hope of finding one new idea, or variation on an old idea, was worth their time. My reason for these introductory remarks is that I am about to begin a series of articles—I won't know how many until I come to the end—about story structure in general, building scenes in particular, and analyzing the result. The example story is Flight 2798 to Phoenix that appears on the pages preceding this article. The issue is not whether the story is well or badly written, but the technique I used to create it. My goal is to suggest ways and means to think about story structure as you develop it. Do not let suggestions you do not agree with deter you. If you do not like them, do not use them, but experiment with those that may be a benefit to see how they work for you. On with my self-analysis. I wanted a plausible foundation for my story. The information I carelessly omitted was the time. I did not give readers the slightest clue as to when the story took place. I think that was an error. I did mention the date later in the tale, but I should have included a time in the introduction, something as simple as; In 1976, she lived with her father, Edmundo, in a small flat among the dregs of society . Perhaps, not a serious mistake, but I have to give myself a B minus for the oversight. The formula: Goal, Obstacle, Conflict, Action and Resolution. 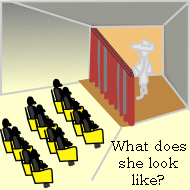 Before beginning to write the story, I imagined the structure as a two-act drama as seen from the audience's position. I do not mean to imply I intended to write a play for actors to perform, but I think of my stories as if they are stage plays. I picture the characters' movements, gestures, facial expressions, but I do not always express these, particularly in a short story. In the following analysis, I will point out places where I let the flow of the story serve as the bridge without specific authorial interjection. I have to be careful I do not leave the audience behind, or not understanding. Well. Here we go. I began Act 1, Scene 1 after the reader learned the story problem and met the two main characters; Lucia as the Protagonist and Edmundo as the Antagonist. The curtain opens with these two on stage. I defined the setting in the introduction as a small flat among the dregs of society in south Chicago; therefore I did not repeat it. The first two lines of dialogue set the tone: Lucia excited; father questioning. I let the lines deliver the image without an action such as, "she danced across the room," which I felt unnecessary. In the third line, "Lucia laughed," confirms her pleasure. Then I used four sentences of internalization to show the boundaries of the conflict. Remember that internalization is unique to writing. I used it here as opposed to dialogue to deliver an image. In the next short one-way dialogue, she expresses her defiance. Then comes the action line of Father picking up the newspaper and shrugging without protest. The first scene ends. The next two-sentence paragraph forms a transition. It is obvious time has passed and I did not preface the paragraph with a comment such as; "During the next two years … ." I try not to use such interjections in the interests of avoiding verbosity. I began the second scene with another two-sentence paragraph of authorial comment about her second job, long hours, and so on. Then I inserted one line of dialogue to establish her self-satisfied appraisal of her progress, followed by another authorial comment designed to show her growing independence from her father. Then comes some sharp dialogue that defines the conflict. My point is every line I wrote had a purpose. As I wrote, I asked myself, "What do I want the audience to see?" The answer: a young woman with a dream who has the courage to pursue it. Her success results in her increasing disrespect for her father. She has started down the path towards her goal and she sees her father as the obstacle. The reader sees the writing formula in action: Lucia's goal versus father's obstacle breeds the conflict. Your take-home message is do not simply string words together. Put them on paper for a purpose: to have your "theater audience" see mental Images of the characters. With that advice in mind, I have to challenge myself because I have not described the physical appearance of my characters. Do I need to do so; or do I not? People living in seedy locations lack funds, and maybe incentive, to dress well and groom with care. Their manners and clothes will not be hard for readers to picture. Because Edmundo makes no effort to improve his lot, whereas Lucia is on the rise, her description becomes necessary. The readers must see her progression from slum dweller to socialite. and invited her to the Fiesta Ball. My method to transform her was to change her from "knowing few social graces and looking like a woman twice her age" to a woman attractive enough to interest a rich man. I end with the comment that despite achieving social acceptance, she continues to place money ahead of romance. describe Sophie Kellermann, the protagonist, which read; "She was neither fancy nor glamorous; an ordinary plain-Jane with a pleasant personality; everybody's friend and nobody's sweetheart." When I ask readers to describe her looks, the response is always the same; petite, short hair ,usually dark blond or light brown, and dark, bright eyes. Where did readers get this information? From her action and dialogue. The gurus going back to Aristotle tell us a story has a beginning, a middle and an end, which I showed in the graphic in Article 50. In my world, the beginning is the set up, which would include identifying the story problem, the setting, and introducing the principal characters. The middle then becomes the body of the story consisting of scenes and sequels describing the characters actions and reactions, both emotional and physical. The end will be the crucial event and the climax where the characters stand in the glare of the truth at last. In the movie business, turning points, which are events that move the story in a new direction, mark the progression through these various story stages. I think the same term applies equally to writing. Notice, I separated the paragraphs starting with "At twenty-one Lucia owned a TV …" through the one ending "...she pursued her ambitions in other ways," by a blank line before and after. She cast her father aside in the preceding scene, returned to the pursuit of her goal by also casting romance aside. This then is a reaffirmation of her pursuit of the goal and nothing is going to deter her from it. The first skipped line signals the passage of time; the second the end of the authorial comment,rededicating Lucia to the pursuit of her goal. Now, I arrive at a turning point; an event that shifts the story in a new direction. It consists of thirteen paragraphs—I count each indent as a paragraph whether it consists of a single line or many lines—in which Lucia becomes Edmundo's partner in crime. Although not stated, the reader should recognize the duplicity inherent in Lucia's acceptance of her father's proposal. The reader may have felt admiration for Lucia's determination to better herself, but now realizes she is not the honorable person first pictured. Did she change? As the author, I do not think so. Raised in an unsavory atmosphere by at least one parent who has little respect for the law, suggests that fair play was not a family value she learned in childhood. The last line of this scene makes it clear that Edmundo is using his daughter for his own ends, probably intending to identify her as the guilty party if the scheme fails. The next seventeen paragraphs begin with the passage of time—indicated by a skipped line—during which Edmundo perfects his plan while Lucia lures Otto into the trap. Act 1 ends with the airport lounge scene. I used internalization by the POV character—Lucia—who, having earned plenty of money to spend on the luxuries of life, remembers the pleasures and tortures of buying exotic clothes and jewels while undergoing facelifts and beauty treatments. Otto arrives, as does Mr. Lopez, and I have completed setting the stage for the next act; namely, I defined the story problem, enunciated the characters' goals and motivations, and set the time and place. I pause for a moment to ask you if you have yet become aware of what I missed? Read on. I have repeated several times since I began this series and I continue to beat the dead horse: The point I am trying to make is that good stories come from good planning. Semantics can sometimes bind us hand and foot, so I want to close with a few words about planning. Currently, I'm showing you how I thought through a particular tale, why I wrote as I did, asking myself repeatedly, "Am I pushing the story forward, or am I simply writing words to fill paper?" When you read the story, you can evaluate my success or failure, but that is meaningless in terms of story creation. Whether authors admit they plan, or they scorn the idea, the fact is every successful author plans in one sense or another. It is essential to good creative writing and cannot be avoided. Part of planning is detecting what is essential for story understanding and what is superfluous. I divided Act 2 into four scenes. The first deals with the interviews conducted by Assistant Inspector Grimes. The purpose is to provide the reader with the background information from boarding the plane until his arrival. Miss Callas is present, but does not take part in this scene. Since she is the POV character throughout the story, I did not use any internalization until she returns in the next scene. After the first writing of the story, I felt it needed more energy and so I introduced Ulrich Bremen for the sole purpose of needling Grimes. He has no role relative to the story problem; a subject I will address later. The second scene of Act 2 begins when Grimes says, "Okay, Miss Callas, you're at bat. Did you know the man in 22B?" After six short lines of dialogue, I return to internalization. Marisa sees the first signs of relief and looks ahead to the end of the ordeal. Grimes challenges her, followed by a paragraph of internalization in which the reader learns Marisa and her father scripted the performance, and Marisa goes into her speech. Then comes the surprise to those in the interview room and hopefully, to the reader, too; Otto is her husband. Let's backtrack to examine if that is a realistic plot point and why her father would not be aware of the marriage. Early in the first scene, I wrote; At twenty-one Lucia owned a TV, a refrigerator, a washing machine, new clothes, and rented a three-room flat, leaving her father alone to grovel in his misery. This shows her separation, implying it is because of her disrespect for her father. Later, I introduced this line: They lived apart in civil discord, each tending their own affairs. This is to reinforce the idea of their separation. I wrote: One day he realized Lucia held the key. It was she who brought Otto de la Fuentes into their lives …. At this point in the story I, as author, know Marisa and Otto are not married, and I doubt if any reader suspects they will be. I wrote: Throughout the next year, Edmundo incubated his plan, … . This fixes a time element. Marisa marries six months before they carry out the crime, leaving the inference she engineered the marriage, keeping it secret from her father after she knew about the forthcoming crime. If the reader feels it would be impossible for her father not to know about her marriage, I provided a pathway back through the story to show in the author's view, it is possible. Whether the reader will make the connection—or will even ask the question—is another matter. Act 2 Scene 3, shows Marisa in the washroom where I introduce more internalization to complete the crime plan for the benefit of the reader. The last scene is the telephone call to her father where she double-crosses him, making him aware she told the insurance company about his fraudulent application. She construes this as her alibi and the reader sees her as the duplicitous character she is. Is the story finished? May I sell it for publication somewhere? I don't think so. Why? Because I committed a fatal error: I failed to visualize the crucial event before I started. Did it make a difference. Absolutely. Editing Note: The following postscript did not appear in the original Internet series. In writing the analysis of the Phoenix story, I arrived at the crucial scene where Miss Pollack accompanies Marisa from the interview, resulting in exposure of her duplicity. Throughout these articles, I have emphasized the benefit of thinking through the crucial scene before beginning to write. Had I done that, surely I would have realized that Lucia, having two aliases and one of them married, would not work. In the story as written, Marisa defeats herself when she departs from her father's plan and reveals her marriage. Her intent is to double cross her father, but she fails. If Grimes does not notice the name problem during the interview, he will the next day when he gets the passenger list. Thus, Marisa's ad lib leads to her downfall and the ending, as written, is wrong and I can expect a rejection slip if I send it to an editor. Return to Article 61 where I wrote short snippets of three possible story lines. In none of them did I develop a crucial scene. When I made my selection, I should have stopped at that point to develop my plan in detail. My point is had I thought through the crucial scene before I began, the error would not have occurred in the first place. Suppose, instead of a short story, I had written a full length novel, only to discover a year or so after I started, I had made an avoidable mistake had I taken more time at the outset to complete my story plan. I finished my story, explaining how I thought through it as I wrote. I put it away for a while; forgot about it by occupying my mind with another endeavor. When I returned, I examined it objectively, searching for errors, inadequate explanations, curious conclusions that evade logic. I usually find much to consider. After tweaking it for a while, I invite comments from selected readers; professional reviewers sometimes, more often members of my writing conference that meet regularly for mutual help. Whoever I ask, I hope they will have a few thousand suggestions, question punctuation, challenge word choice, and find weak links in the plot. I know during their inquisition, I will feel I will never write again as I struggle to control my sensitivity. I accept this because these kinds of reviews and challenges result in good stories. Why did A do this; why did B react that way? Was it nighttime or daytime when A and B …? Many writers rely on inferences and assumptions, sometimes so elusively as to escape the reader. I hope to find the ones in my stories. Before I subject my critics and me to the ordeal, an important question arises: Am I the author of my story, or a reader of my story? The answer is: Both. The author is automatically the first reader. It cannot be any other way; author when writing, reader when editing or evaluating. But, it is at best difficult, at worst impossible, to be both writer and reader at the same time. The author controls what happens and when, that's all! As a reader, the author must forget he or she created the story. But, the author's familiarity trumps the reader's curiosity. Playing two roles while evaluating the same subject is problematic. Clear communicating is the standard to consider when playing the reader role. A danger exists the words may deliver a distorted or unintended image. Here is a sketch to explain my point. Consider the letter X. I have merely to miss one leg and I write Y instead of X. If this occurs in my communications, the reader receives the wrong image. I alone must make the corrections by evaluating my work and considering where I succeeded and where I failed, because nobody can do it for me. As author, I am the only person who knows the intent; everybody else is interpreting the result. Even after I receive my critics comments, I must decide the validity of their remarks and select those I want to incorporate into the work and reject those I do not. By way of example, after reading Flight 2798 objectively, I realize I may have made a thematic error. Does the story espouse the idea that crime pays? If so it is immoral and preaches unethical behavior. That certainly seems to be the case. I am at a crossroads. Because immorality is offensive to me, I must either scrap the story or change it. I'll examine some alternatives next week. This forces a change in the telephone conversation with her father. The words, "… savoring the sounds of his agony …" must change to reveal that she knows she has been wrong and regrets being an accessory to the plan. Finally, one more change: "When Grimes gets the coroner's report and finds out how you and Ulrich Bremer killed Otto …." By making these changes, I will alter the thematic message from crime pays to one were morality overcomes temptation and truth prevails. As you study this exercise, evaluate the analysis and suggestions supporting it, not allowing the style or quality of the writing to divert you. Developing the crucial event: All of the deliberations and considerations of the last two articles should have been evaluated before I began the story. Would they all come to mind before I begin. Not necessarily, which suggests sketching out a series of events and arrange them into a logical sequence. Conclude the plan by delving into to the details of the crucial scene to determine the outcome and consequences as much as possible. Not only are you concerned about the story problem being clearly enunciated, you are also concerned that the ending is logically presented. Instead of relying on readers to suspend their disbelief, as is often quoted by writing experts, I believe it is better to strive for logical realism? To do this, imagine you are writing a true account of the incidents you portray and test your assertions for legitimacy. What do critics mean when they say a book has a slow pace? The question gnawed at me, so I set out in search of an answer. One writer declared, without explanation, that "good pacing is essential in good writing." An equally trite statement might be to say a good driver needs good driving habits. I cannot learn from an inane proposition that tells me nothing. I checked my books without success. Authorities gloss over the subject with generalizations such as, "a proper pace is important." In describing pacing, one writer used the adjective "mysterious." Another suggested that pacing is an intuitive sense. When I use a term, I believe I should understand what I mean within the context of how I use it. As I often do when I have difficulty with terminology, I turn to the dictionary. To my surprise, Webster devotes twenty lines to the word pace. Most of the meanings relate to walking, measuring, or rate of movement. One, with a little stretch of imagination, strikes me as relevant to writing: Rhythmic animation. As I write, I'm wrapped in my story, my characters, and my scenes and sequels, but the textbooks suggest I should think about pacing, despite the inability to define it. Since I do not understand the meaning, and nobody seems able to tell me, I substitute a new name, one more germane to me as I hope it will be to you. I called it tempo. I do not mean tempo in the sense of a rhythmic beat, but rather as an undulating wave rising, cresting, and crashing, followed by another wave. I try to give my story a tempo that rises and falls and moves forward as all waves do, yet they vary in size. Writing texts address the idea of moving forward under the heading of pacing with statements like; "Every word in every sentence must move the story forward." I would translate to the tamer statement; a writer should understand how a sentence serves the story purpose. Lacking such understanding, authors should consider deleting or revising. I dislike vagueness, but nonetheless I have to say tempo is a sense I need to feel as I write. Where am I on the wave? Should I slow down for a moment? Is it time to explain or summarize, or do I rush onward with the next action events? Again, I stumble because my definition is no more practical than the trite expressions I complained about. I need another approach. After much thought, I decided fluency is the main constituent of pacing; the ability to write words that flow with ease and grace so readers move effortlessly from page to page without any thought of tempo. There should be no bumps in the road, meaning places where the reader has to do a double-take, retreat and read again. When that happens, the tempo halts. The next time you read a book, notice what happens when you come to a passage that stops you. You reread, trying to understand the passage, but the interruption arrests your enjoyment and you complain the book lacks good pacing. On the other hand, if you analyze a page-turner you can't put down, I believe you will find the author hooked you through fluent suspense; an effortless, cohesive, and clear articulation of words, Images and ideas. This may apply even to a single sentence. Here is a line I recently stumbled across: "He left the room there for a moment." Boom! I'm stopped cold because the image of taking the room somewhere is beyond anything I understand. Is "there" an editing error, an oversight, or does the author intend something else? The failure to write fluently disrupted the pacing of the story, and thus my reading enjoyment. I think the concepts inherent in the words fluid and fluent explain pacing. As first reader of your own work, sense the rhythm as you revise.